In 5- to 6-quart slow cooker, mix corn, beans, diced tomatoes, tomato sauce, green chiles and onion. Stir in broth, chicken and taco seasoning. Cover; cook on High heat setting 4 hours or Low heat setting 8 hours. While soup is cooking, heat oven to 425°F. Brush both sides of each tortilla with vegetable oil. Stack tortillas, and cut into 1/4-inch strips. Spread in single layer on large cookie sheet, and sprinkle with salt; bake 7 to 9 minutes or until golden brown and crisp, stirring halfway through to ensure even browning. Cool. When ready to serve, ladle soup into serving bowls, and garnish with tortilla strips, cheese, sour cream, cilantro and avocado, as desired. Looking for a shortcut? Use crumbled purchased baked tortilla chips in place of the recipe’s tortilla strip garnish. Pinto beans can be substituted for the black beans. This soup has it all. It’s packed with flavor from fire roasted tomatoes, green chiles, taco seasoning and chicken broth. 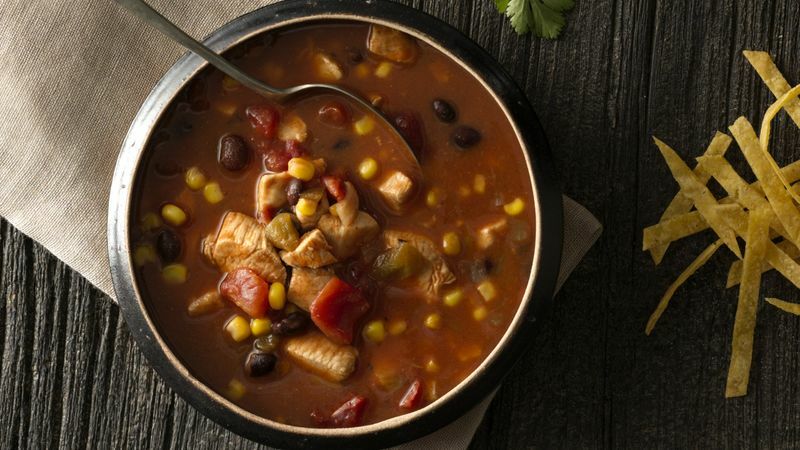 It’s rare that a soup can pack such a hearty punch, but the chicken and black beans in this chicken taco soup add up to 26 grams of protein per serving! We love our slow-cooker recipes because you have the flexibility to cook on low for eight hours or you can cut the time in half by cooking on high if you need the meal sooner. As with other Mexican meals, you get to top this soup with your favorite garnishes, whether that’s shredded cheese, sour cream, cilantro, avocado or all of the above! If you’re looking to step up the spice, add in a little of your favorite hot sauce before you eat. Looking for more taco recipes? We’ve got those too!